You are buying the Poucho Diabetes Cooler Carry Case Large Blue. Poucho large cooler is designed to keep your items temperature controlled while not limiting your ability to be free. This blue Poucho diabetic wallet is activated by water. 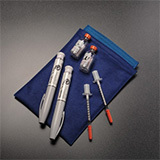 The Poucho Diabetes Cooler Carry Case is great for active travelers. It can be used and reactivated hundreds of times - stays cool up to 4 days. It is also available in multiple sizes to accommodate your needs.